Sophie la Girafe is famous in the parenting world, as famous as Mr Tumble or Peppa Pig! The iconic giraffe is spotted in the hands of so many babies and toddlers as she's not just ideal for teething but she makes a great toy too. Noah had his very own back when he was small and I’m already planning on buying one for Ava once she starts teething, we are such big fans! Did you know that the brand doesn’t just stop at toys but they also have their own skincare range too? 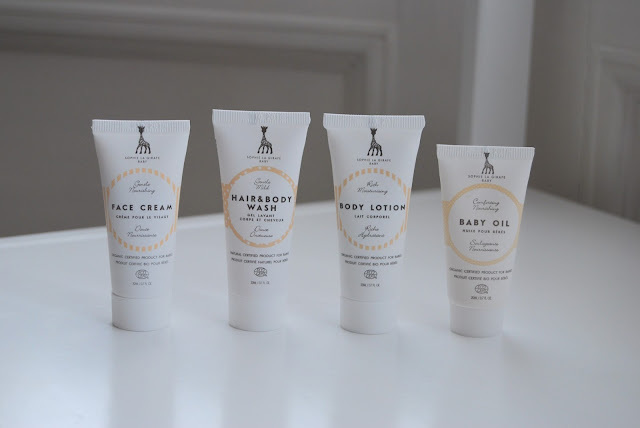 Sophie la Girafe Baby is an award winning, certified natural and organic skincare created for babies and sensitive skin of all ages. We were recently sent their starter kit to try out and I couldn't wait to give it a try. Sophie la girafe Baby Face Cream 20 ml - a face cream for sensitive skin. Sophie la girafe Baby Body Lotion 20 ml -a rich and nourishing moisture lotion. Sophie la girafe Baby Oil 20 ml - a multi-purpose and luxurious baby oil. Sophie la girafe Baby Hair & Body Wash 20 ml - a nurturing, gentle cleanser. Also includes a lovely Sophie greeting card, enhancing an already perfect gift. The Sophie La Girafe starter kit is perfect for our bath time routine and for Ava because each product is ever so kind to her delicate skin. A little product goes a long way too as I only needed to use just a dash of each when bathing or moisturising her. As you can see having a bath is one of Ava's favourite things so it was wonderful to include the SLG Baby into our routine. After Ava had her fill of splashing about in her tub and from smiling from ear to ear I quickly got her dry and used a little of the SLG baby oil which is absolutely divine. So divine in fact that I've been using it myself. I adore the gentle scent of all the range, how kind it is to sensitive skin and I'm looking forward to continuing to use it at every bath time. 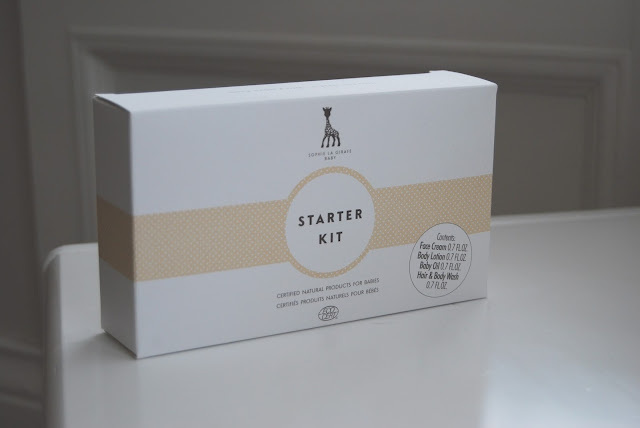 How would you like to win a Sophie La Girafe Starter Kit? To enter all you need to do is use the Gleam form below! Good luck and don't forget to enter my other blog competitions! So cute. I would love to win this for my little nephew. He is nearly two weeks old. For my sister and my baby niece! I would like to win it for my 6 week old little boy! I would love this for my little boy. I would love to win this for my younger brother who is expecting his first child this year! Myself, for our wee one! I'd love to win for my sister, who's due at the end of summer! This would be great for my stepdaughter who is expecting her second baby! I would love to win for my new baby Grand-Daughter. I would love to have this for my newborn baby. I would love to win this set for my nephew. I'd love to win for my friend who is about to give birth! I would love to win this gorgeous prize for the little bundle who is due to join our family in December! Our newest family member arrived in February and would love it. For my little grandson Jacob.